Are you interested in counseling campers in our residential camp program? The experience you'll gain while working as a camp counselor is some of the best preparation for life you'll ever have! Working as a counselor will give you opportunities to learn more about yourself, to serve others and to share your faith in Christ. Must be 18+ years old and out of high school to apply. Counseling staff will be required to complete online training assignments before joining us onsite for an intensive week-long Staff Training Week. Applications are still being received. Ready to apply? Click here to apply online! If you are passionate about serving others and deepening your relationship with Christ through discipleship and community, this could be the job for you! Each summer, we hire high school and college-age individuals to serve as Lifeguards, Kitchen, and Store/Recreation staff. Age requirements vary by position. 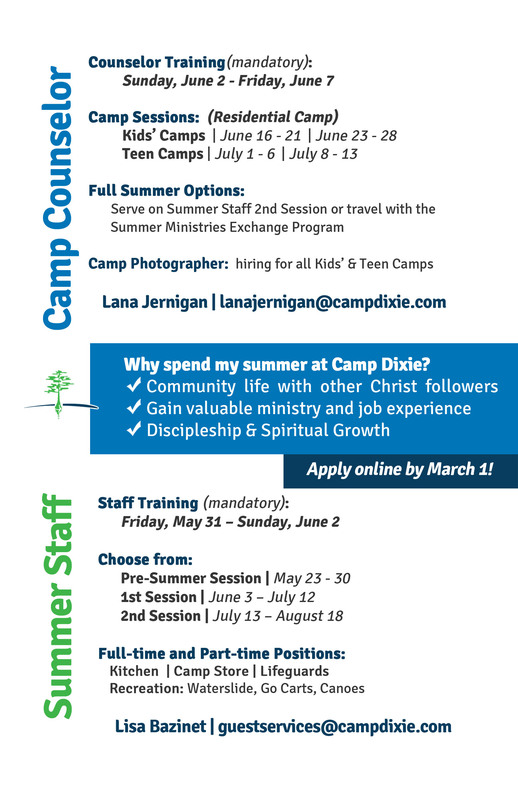 For questions or more information, email guestservices@campdixie.com. The Summer Staff Coordinator is the connecting channel between the Camp Dixie Residential Staff, Summer Staff, Summer Camp Staff and Guest Groups. This job requires a unique mix of spiritual maturity, administrative skills and mentoring! Duration of this job is from Mid-May to Mid-August. Click here to apply for Summer Staff Coordinator Job! Are you passionate about photography? Are you interested in utilizing your talent in the camp setting? This may be the place for you! The photographer will live onsite during five weeks of summer camp and capture all the activities and excitement of our campers! Applications are still being accepted. Are you interested in becoming a camp counselor in the future? If you are entering grades 10-12, you can receive on-the-job training to prepare you for future counseling positions at Camp Dixie through our CIT program! You will complete assignments, attend a weekend training session, and have the opportunity to serve one or more weeks alongside an experienced camp counselor this summer. All CITs are required to attend Teen Camp #2 as a camper. Applications are closed for 2019. Check back next January!